On Your Mark, Get Set, Prepare! Triathlon Season Is Beginning | Podiatry Associates, P.C. Triathlons have been growing in popularity over the years, bringing new and returning athletes to the sport from a wide variety of age divisions. Not every triathlon participant is in the proper shape for this high endurance sport, especially with the influx of newbies. Don’t let yourself be an underprepared triathlete—train properly to avoid problems. Swimming is the first leg of a triathlon, and it is generally referred to as a cardiovascular sport. While cardiovascular training is important, strengthening and conditioning are equally important to prevent injury. “Swimmer’s shoulder2” is a common injury associated with overuse, and it leads to a painful shoulder that may eventually halt swimming all together. Proper strengthening to your rotator cuff and scapular muscles can prevent swimmer’s shoulder from occurring. 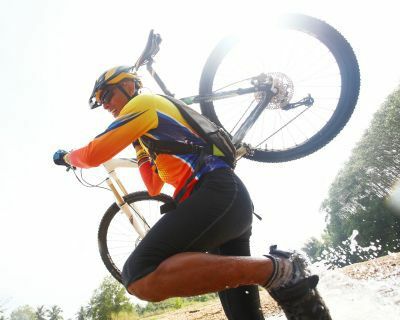 Biking is one of those things the body never forgets how to do, hence the common saying, “It’s like riding a bike.” This also implies that the 2nd leg of a triathlon is generally the most relaxing of the three. But with the lengthy biking mileage required during triathlons, it is important to have the proper training in place to prevent injury. Make sure you are getting some long bike rides logged, in order to build up strength and endurance. Running is the final leg of a triathlon, and if the transition from biking to running doesn’t leave your legs wobbly, then the run will. This last stretch requires endurance, stamina, and mental hoaxing to finish. But once you cross that finish line, the glory is all yours. According to USA Triathlon1, below are the typical swim, bike, and run distances for a Sprint Triathlon, Olympic Triathlon, Half Ironman, and Full Ironman. If you are training for an upcoming triathlon this summer, and are unsure if your preparation is adequate, don’t let your questioning hinder your training. At Castle Pines Physical Therapy, we specialize in sports rehabilitation. We would be happy to review your training program and give you additional pointers and training specific exercises to make you feel great when crossing the finish line. Call our office at 303-805-5156 to schedule an initial physical therapy evaluation or initial wellness session visit.